The School of Celtic Studies, The School of Theoretical Physics and The School of Cosmic Physics. 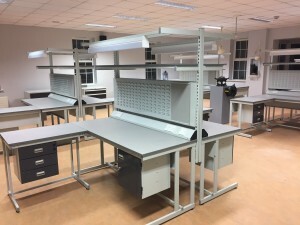 Superior Storage Solutions were commissioned by the DIAS Geophysics Section to fitout in December 2017, a specialised workshop to enable calibration and maintenance on their newly procured ocean bottom seismometers which were specifically manufactured in Germany for measuring motion of the ground under the Irish Sea. At Superior Storage Solutions, we supply and install a wide range of quality manufactured workbenches and workshop equipment across Ireland, on this occasion supplying a combination of our ever-popular cantilever workbenches and under bench mobile industrial drawer units. 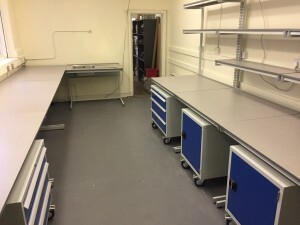 All the benches supplied with 20mm thick laminate worktops, were fitted with retaining lips to the rear and numerous above-bench accessories such as matching 300mm deep laminate upper shelves, with one of the benches containing an ultra large stainless-steel sink for washing the seismometers. The all steel drawer units were fitted with full width drawers containing; full extension precision ball race slides, an anti-tilt feature and central locking, each drawer delivering a load capacity of 100kg per drawer. December 2017 was a particularly busy month for workshop fitouts with Superior Storage Solutions completing three workshop installations over a duration of three weeks.